Seventh grade, the renaissance and its masters, Joan of Arc, King Arthur, algebra, the Age of Exploration, creative writing, human physiology, the experience of physics and chemistry through experimentation…. it is a time of great changes emotionally and physically for the children and the curriculum meets them there. Matthew Vander Veen was born in Southern California, and spent most of his life there enjoying the weather and the coast. After graduating high school, Matthew went on to work various jobs that left him unfulfilled. Matthew decided to go to Hope International University and receive a BAS in Human Development. Upon graduating, Matthew began working at a private school in Newport Beach California teaching Physical Education, Medieval World History, and Public speaking for 11 years. Matthew and his family decided to move to Southern Oregon for a slower pace of life and a different environment for his three children to grow up in. 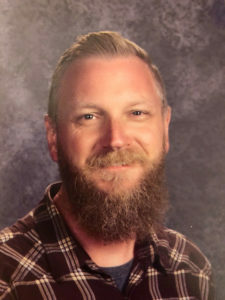 Not long after moving he helped open and ran Hearts with a Mission in Grants Pass, and worked for Options for Southern Oregon as the skills trainer but felt that he was missing time in the classroom. This desire to teach in the classroom again has brought him to Madrone Trail.